Description (ebay): Children will be able to write in color on the see-through screen, which is perfect for tracing. We do not accept requests for variants. Children will be able to write in color on the see-through screen, which is perfect for tracing. We do not accept requests for variants. - The image stays as long as you need it to and can be erased with the touch of a button. Your boy or girl can create again and again, without the need to charge or connect. - The perfect gift for a boy or girl with 4 stylus and 18 different stencils! See through screen makes it great for tracing! Study math, practice letters, trace your favorite comic book heroes and more! - Unleash your childs creativity! 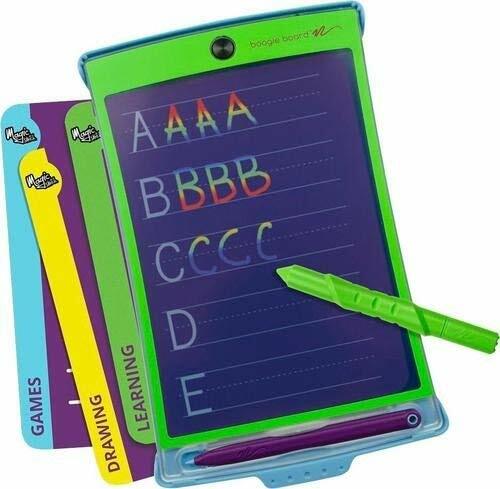 This smart electronic notepad allows your child to draw, scribble, trace, doodle, and erase easily! Plus, it's super durable and water resistant! - Great for toddlers, children, and moms! Use on the go in the car to keep your childs creative juices flowing and prevent boredom! Great for restaurants too! - Actual customer review: "This was a stocking stuffer gift for my 8 1/2-year-old granddaughters and she loved it. She experimented with each stencil and spent almost 3 hours with it as soon as she opened the gift. She enjoys art, drawing, painting/coloring, etc, so the first thing she did was draw/color all the drawing stencils, which were all beautiful. She also enjoys writing stories, plays, and lyrics for songs and enjoyed the writing blank inset."